The St. Laurence athletics department has robust roots that reach all the way back to 1961. As members of the Chicago Catholic League and Girls Catholic Athletic Conference, student athletes can tap into the long-running tradition that has made St. Laurence a multiple championship holder. Want a closer look at our athletic facilities? To keep up in Chicago Catholic League athletics, it’s necessary to have the very best places to train and compete. 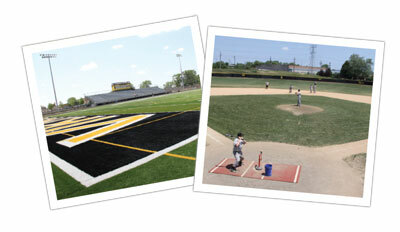 St. Laurence boasts some of the finest athletic facilities in Illinois. All of our facilities are on the 23-acre campus of our campus. Each facility is fully enclosed, providing maximum security for our athletes during practice and competition. This state-of-the-art facility was built in 2008 and is home for Vikings football, soccer, lacrosse, and track. The playing surface is Field Turf, and there is a world-class track that surrounds the field. Kavanagh Stadium has lights that allow football, soccer, and lacrosse all to play games at night. A state-of-the-art scoreboard was installed when the stadium was overhauled, and there is seating for 1,250 fans. Not only is Viking Field one of the premiere baseball stadiums in the Catholic League, it’s one of the best in high school athletics. Viking Field was completed in 2008. Amenities include in-ground dugouts, a brick backstop, a two-story press box, two turfed batting cages, and a three-mound bullpen. The field also has a 14-foot tall berm spanning from left-field to center-field that is a great place for watching games. Atop of the berm is a large state-of-the art 9-inning scoreboard and message center. The spacious gymnasium has been recently updated with new bleachers and a fresh coat of paint. Also, brand new main and auxiliary scoreboards have been installed for the basketball, wrestling, and volleyball seasons. The gym holds 1,600 and has a great environment for Catholic League sporting events. The 2,500-square foot Charles Grunhard Fitness Center was made possible by Tim Grunhard, class of ’86 and former Pro-Bowl center of the Kansas City Chiefs. The fitness center is equipped with exercise machines and weights that can accommodate up to 65 people. The brand new girls locker room houses our in-season female sports. The space has 75 lockers and is connected to a shower room, which has 3 private shower stalls. The recently constructed boys basketball locker room provides the team a home inside our gym. The space contains large lockers, personal lock boxes and a flat screen television for film review. Four full-size tennis courts are situated on the west end of campus. They are recently renovated, hard-surface courts that are utilized by our tennis team in the spring. These recently repurposed rooms provide female athletic teams a secure, private area to change and prepare for practice. STL has two grass multi-purpose practice fields situated near Kavanagh Stadium and Viking Field. One field is equipped with football goalposts and the other with soccer goals. There is a discus throwing area on one of the practice fields, and there is also a shot put area between the tennis courts and track. The recently constructed wrestling room is used by St. Laurence’s wrestling team. The room is equipped with wrestling mats and fitness equipment to ensure our team is able to practice technique while also building their conditioning. St. Laurence has two indoor turf spaces. Our indoor batting cages are used by our baseball and softball teams, while our speed and agility room has resistance training bands and is primarily used to help athletes improve speed and footwork. Both spaces allow athletes to improve their skills no matter the weather.